3.1 out of 5 based on 16 bloggers and 21 commenters. Chuana Flash is a free blogger template with 2 columns, responsive design, magazine-styled, seo friendly, right sidebar, gallery-styled, an exclusive design for Blogger, ads ready, footer columns, social bookmarking icons, posts thumbnails, breadcrumbs, related posts support, well designed threaded comments, 404 error page customized and neutral colors. Everytime I embed my flickr photos in my post the image or photos are going to resize/stretch how can i fix that? thank you. additional info : insert image via upload is good. Hi Israel, could you publish a url of your blog with this problem? Hi Israel, it is cause by the script that create the thumbnails in order to fit the design. With some sizes it works excellent, with others no so well. You can try with your own images. Hi Rendy, in the last version of the template, you don’t need to modify anything. Please, download it again. Es muy bonita la iba a usar pero tiene dos fallos, lo mas importante no tiene paginación de ninguna clase en la portda, solo en las paginas individuales, otra cosa que pasa es que no deja ver el box facebook, el breaking news me ha costado un horror encontrarlo, esta en un script abajo del todo encima del body final de la plantilla, tiene el feed del blog blogger buzz, dile al diseñador que ponga la paginacion mejor la antigua que la de numeracion, la de numeracion si tienes muchos post no vale, gracias Francisco, un abrazo me alegra verte de nuevo activo. jeje un poco exagerado quizá pero creo que cumple su función. Gracias Ipsa. Por cierto, nos conocemos de algún lugar, se me hace muy familiar tu nombre. Abrazos! Hi, I am using this template but the menu tab doesn’t work well for mobile. how can I fix that? Nice template. Thanks for sharing. Amigo no hay preview de la plantilla y al instalarlo me borro bloger el blog…ni idea de lo que paso..
la plantilla esta funcional? la implemente para un blog que voy a empezar pero viendo los ultimos comentarios, ya estoy comenzando a dudar.. esta bien para los telefonos? Efectivamente.. el meno en dispositivos moviles queda por debajo de las entradas, y eso no permite que se pueda ver. Hello. How can I disable the comments in the pages? I am not able to do this, because there is not option. Thank you in advance. I love this template but I have the same problem as Megumi said! The menu tab doesn’t work at mobile phones! It opens “behinde” the posts and there’s no way to use it… Could you give us a solution for this problem??? I really want to use this template for my blog!! Thanks! 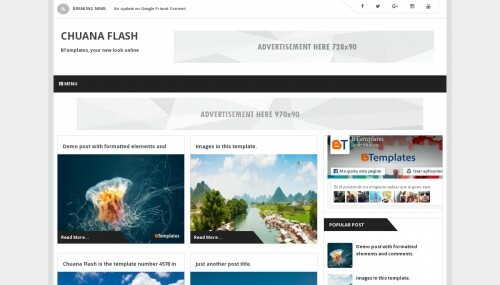 Btemplates is the best site to download responsive theme for bloggers. It really helps every blogger in starting days of their blogging career. thanks for making this beautiful site.